The objective of the boys and girls athletic programs is the instruction of the students in the basic skills, rules, and strategy of each sport combined with the building of character and good sportsmanship. 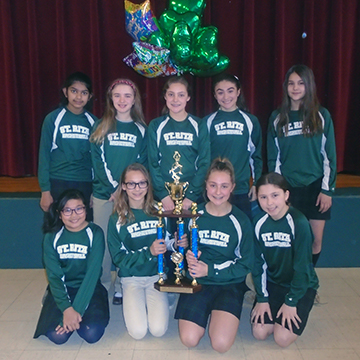 St. Rita School offers two winter sports, basketball for students in 3rd through 8th grades and cheer squad for students in 5th through 8th grades. Basketball tryouts will likely be in mid to the last week of October. Cheerleading will have an informational meeting for the parents and students in mid October. Please see our winter sports flyer for more information. We look forward to a fun and exciting season! Schedules are available as the season approaches. Schedules are subject to change (weather permitting).